The java 9 JLink tool enables you to create a runtime application by assembling a specific set of modules. With this tool, Java 9 now has the capability to create an application that works even if you don’t have the JRE installed. JLink creates a minimal JRE required to run your application. It allows optimizing the runtime for the modules that you have included. The JLink tool adds new functionalities and also opens up a few possibilities. Here are some of the advantages. The runtime image can be optimized since it is possible to optimize the custom application module along with the platform modules. Since the runtime created by jLink contains only the required modules, the size of the module is small. This opens up the possibility to use the application inside embedded and IOT devices. There are a few caveats to using the JLink tool. When the user updates the JRE on her machine, the runtime image created by JLink does not get those updates and so any security fixes will not be applied. Let us now look at an example of how to create a runtime image using JLink. We will create an application from the modules that we created as part of the modules tutorial here . We created the HelloWorldModule and HelloWorldModuleHelper that together take in a string and print “Hello World ” on the console. Lets take both the modules and built a runtime image out of it. 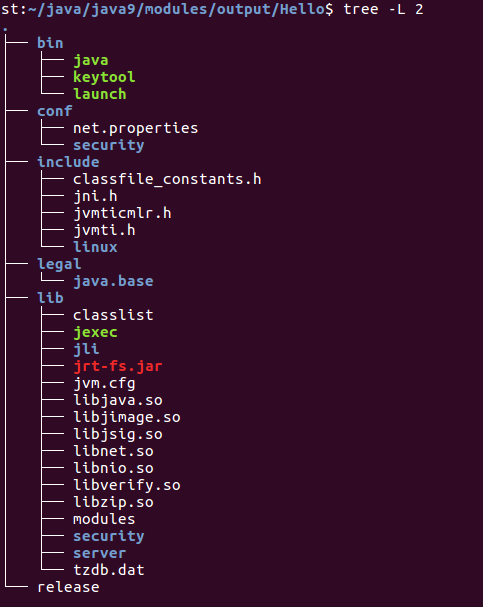 The jlink binary is inside the bin folder of the jdk. –add-modules tells the tool which modules should be the part of the runtime image. The tool adds the modules specified here plus all the modules that are required by this module recursively. –launcher tells the tool that we need a launch script that will launch the runtime. If not specified, the tool will only create a java executable and we need to run the main class. –output specifies the output directory where the runtime image would be created. To run the application cd to the “Hello” directory and type in “./bin/launch StudyTrails”. This will print “Hello World StudyTrails” on the console. To summarize, JLink provides an optimal way to create a minimal runtime environment that can run with any external JRE. Its most promising use would be in IOT and embedded devices.